In the World Rally Championship, a Volkswagen Polo is the weapon VW deploys to annihilate the competition. But for Global RallyCross, they're about to unleash a nasty beast of a Beetle that no one will be making flower vase jokes about. 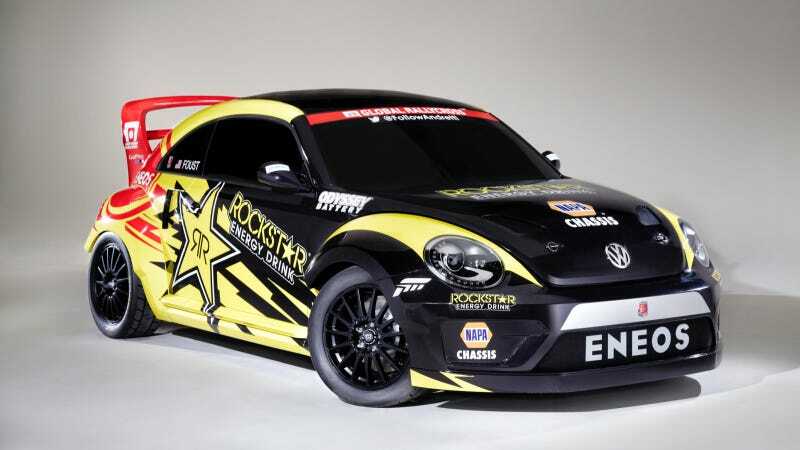 Meet the Volkswagen Andretti Rallycross Beetle, which will be piloted in this season's GRC season by Tanner Foust and ex-Formula One and NASCAR driver Scott Speed. Volkswagen says they'll be starting the season in Polos very similar to the WRC cars and "will switch during the season to the fearsome GRC Beetle." How can a Beetle be fearsome, you ask? Because this one has more than 560 horsepower from its turbocharged and direct-injected TSI engine. I'm pretty amped to see this thing take 70 foot jumps on a GRC course. This is absolutely nuts. I love it.